Demographics can be kept up-to-date in VCAT and used to inform on student performance when running reports. If an SU is using our VCAT Import - Assignments feature and their Student Information System houses the students demograhics, demographics can be added to the nightly file(s) we receive to be automatically updated when the importer is run. Make sure to let us know when demographics are added so we can adjust the agent to include them in the import process. When the students demographics are maintained in the Student Information System, part of the nightly file(s), and we have set them up for you, running the importer is all that is needed to update them in VCAT. When student demographics are not maintained in the Student Information System, they can be manually updated in VCAT. Students can only be assigned to existing demographics. If the demographic doesn't exist yet, you will need to create it first. Under the Data tab, click on Demographics and Groups. You can choose to select the specific demographic set, demographic variable, and demographic value you're interested in, and click on the i that appears when you hover over it with your mouse OR you can click on anyone's little i, and you can select the one you're interested in on the left in the Edit Demographic dialog. To assign a student to this demographic value, type part of his last or first name in the field under Add Student to search the student and click to select. The student name will show under the Assigned Students with a green background. The color green indicate that this is an added unsaved change. If you pick the wrong student, you can remove it by clicking on the red circle in front of his name. To unassign a student already assigned to this demographic value, click on the red circle in front of his name. The student will display in red with a strikethrough until changes are saved. 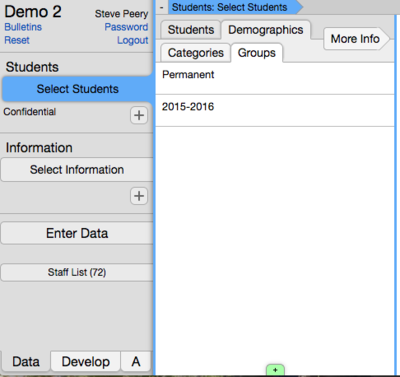 It is possible to assign and/or unassign multiple students to different existing demographics within the same editing dialog. You can go from one demographic to another by navigating on the left in the dialog, and selecting different ones. Each demographic value edited will show with a solid green border, while its related demographic variable and demographic set will display a dotted green border, to indicate that changes have been made but have NOT been saved yet. When you are done, click on Apply Changes - to save the changes and remain in the dialog - or click on Apply and Close - to save the changes and close the dialog. Each Demographic Variable (eg IEP, 504, Gender, ...) must have a Demographic Value ( Yes, Y, Female, Male, F, M, ...) and needs to reside within a Demographic Set (eg Permanent, 2015-2016, 2016-2017,...). Gender, Race, and Ethnicity should be part of a demographic set called Permanent. Any demographics that can vary through the year, and from one year to another, should be kept in a specific yearly demographic set (2015-2016, 2016-2017,...). Under Demographics and Groups (under Data tab), click on the + at the very bottom of the Demographic Set column to add a new demographic set (like 2016-2017). The newly created set is called New Demographic Set by default. Click in the field to type in the appropriate name. Click on Apply and Close to save the new demographic set and close the dialog. The next step is to add a Demographic Variable to this newly created demographic set. Select the Demographic Set in which you wish to add a Demographic Variable. The newly created variable is called New Demographic Variable by default. Click in the field to type in the appropriate name. By default, 'Ignores Automatic Updates' is also checked. Keep it checked if there will not be any automatic updates done using the importer. Ignore the code as it is only relevant with the automatic updates using the importer. Click on Apply and Close to save the new demographic variable and close the dialog. The next step is to add a Demographic Value to this newly created demographic variable. Select the Demographic Variable in which you wish to add a Demographic Value. The newly created value is called New Demographic Value by default. Click in the field to type in the appropriate name. 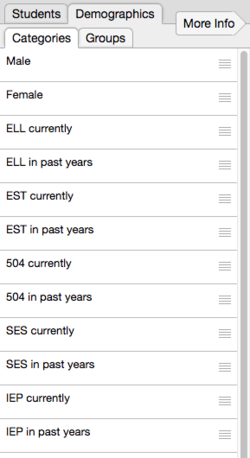 In this sample, you would select any category identified with 'currently' if you were interested only in the Current Year, and Past Years if you were interested in knowing if the students were ever previously assigned to that category. 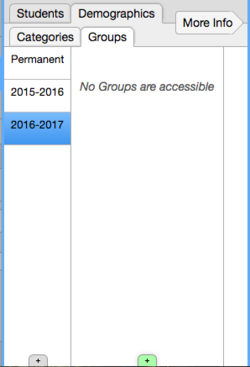 Click on Apply Changes to save the new demographic value and remain in the dialog (You're ready to assign students!) or click on Apply and Close to save the new demographic value and close the dialog. Demographic Sets, Demographic Variables, and Demographic Values are, by default, visible but, they can also be hidden. There is an Active checkbox for demographics. When checked, the demographics are visible. When unchecked, the demographics are hidden. Users with FULL ACCESS will always see and have access to the demographics, no matter if they are marked Active or not. Example: if you wish to no longer have an old NECAP demographic set visible, as it's no longer used by anyone, you can select it, uncheck Active, and hit Apply Changes (or Apply and Close) to save your change. When a demographic set (e.g. NECAP 10-11 Fall) is hidden (no longer visible to regular users), the demographic variables (e.g. 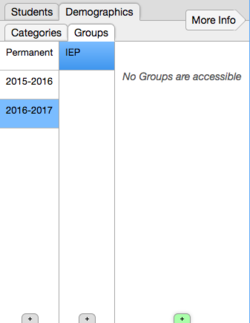 IEP) and values (e.g. Yes) within that demographic set are also hidden. Demographic variables and demographic values can also be independently set to be hidden within a demographic set that is still marked Active and, therefore, visible. This page was last modified on 17 January 2019, at 14:25.